Alan Bennett’s 1991 part history lesson, part comedy is a curious beast that may well owe its popularity and awards to the performance of the character of King George himself. Here the title role is played by Mark Gatiss (possibly most familiar to audiences via his role as Mycroft Holmes in the television series Sherlock, of which he is also co-creator). Mr Gatiss’ performance is truly astonishing: a sustained tour de force, he gives us a character who is eccentric, embarrassing but somehow – and so importantly – admirable and endearing, and then excruciating and painful when in the depths of ‘madness’ and tortured by his doctors. Above all, George is a flawed and suffering man who happens to be king – a position of which he feels compelled to remind others over and over. This is Mr Bennett’s version of George III, but why not? No one really knows the cause of King George’s madness; most likely it was porphyria, but it is possible to infer from the text and performance that a component, at least, is shame and humiliation at having lost the American colonies. Mr Bennett is perhaps wryer and less psychological, less naturalistic than Peter Morgan (The Queen, The Crown) but both remind us that the royals are human beings in a kind of show business and under intense pressure. Debra Gillett as Queen Charlotte is quite delightful – even if the accent comes and goes – conveying in a highly individual manner the intimacy and love of a long marriage and the way this little woman becomes a fierce fighter in defence of her husband, mad or not. But once George is mad, he is, so to speak, just mad. He is the fulcrum of the drama and we feel for him, and the fate of Britain may depend on his sanity, but the ‘hero’ becomes Prime Minister William Pitt – ‘Pitt the Younger’ (Nicholas Bishop) - as he strives to hold the country together and resist the frustrated ambition of the pudgy Prince of Wales (Wilf Scolding) and the cynical opportunism of radical Whig Charles Fox (Amanda Hadingue). (This is Mr Bennett’s version of Fox, but never mind.) Mr Bishop’s Pitt is rightly a held-down, completely non-flashy performance – and the more impressive for that. The other important role and a beautifully judged performance is that of Adrian Scarborough as Dr Willis – a man of limited education, narrow horizons and dogmatic moralising, and yet who imagines he heals George through what we would today call ‘tough love’. George himself credits ‘Time’. The text indicates twenty-four characters – huge in today’s straightened circumstances. Director Adam Penford opts for doubling in the minor roles, but he also has three women play the quack doctors who glom on poor George. Ms Hadingue plays the excrement obsessed Dr Pepys as well as Fox, and Stephanie Jacob plays both Dr Baker and Fox’s ally Sheridan. Ms Jacob is able with both characters, but these double roles are distracting – as is Louise Jameson in the single role of Dr Warren. I can’t really see the point – beyond the mantra of ‘more roles for women’. Yes, more roles for women, but when it enhances the play. Is this casting ironic? Some kind of comment on the characters? Not that I can see. Nadia Albina gets away with Fitzroy, perhaps by being slightly wooden. On the other hand, the statuesque Sara Powell as Lady Pembroke is unmistakeably a woman – as the role unmistakeably requires when ‘mad’ George develops an uncontrollable lust for her. 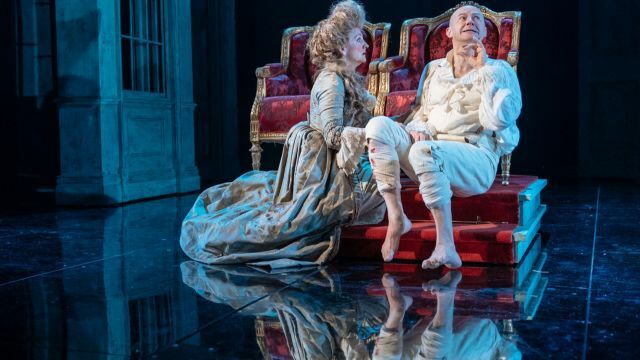 In any case, the play gets a sumptuous production at the Nottingham Playhouse with a well-resourced, ingenious and imposing set (design by Robert Jones) with many changes necessitated by the numerous short scenes – also a challenge for Lighting Designer Richard Howell and Mr Penford. It is the great performances in this production that definitely make it worth seeing. As history it is dubious and yet it is curiously relevant to Britain and Brexit today as a nation comes under threat through lies, delusions and overweening ambitions.